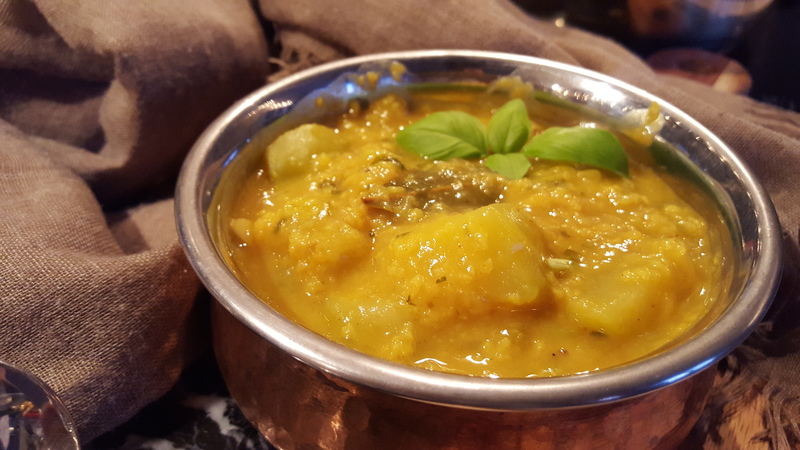 This is a very simple and easy dish to make; a very typical home cooked food that we enjoy very much in Mauritius. Chayote is a vegetable that is easy to grow usually seen running along fences, over shrubs, and even straight-up trees. 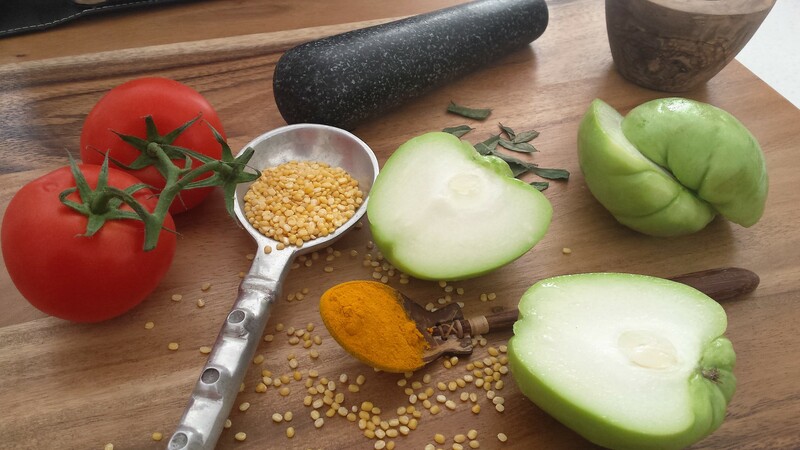 Chayote like pumpkin is one of the vegetables, which are very low calories, no saturated fats or cholesterol. However, it is rich a source of dietary fibre, anti-oxidants, minerals, vitamins in particular B-complex. Like in other gourd family vegetables such as courgette or zucchini they too provide moderate levels of potassium. These compounds help scavenge harmful reactions from the body and hence play a role in prevention of cancer, aging and various disease processes. Being a low-calorie and fibre-rich vegetable, it is recommended in many diet in cholesterol controlling and weight reduction programs. Chayote was one of my papa’s favourite vegetable not only because they were easy to grow but above all they are very tasty, melts in the mouth. They are full of flavour and full of all goods things. We’ve always had these vegetables in abundance in our Home gardens in Mauritius. I remember as a child, my dad would sometimes come home for lunch, and mum would quickly run into the garden pick a few “chowchow” and cook them in just a bit of onion, garlic, few simple spices, fresh thyme and a dish would be ready in a flash. Now knowing about some of the health benefits, made me realise why my papa loved these vegetable so much. He could just eat them with plain boiled rice or fresh bread. He certainly knew the usefulness of these lovely fresh squash. 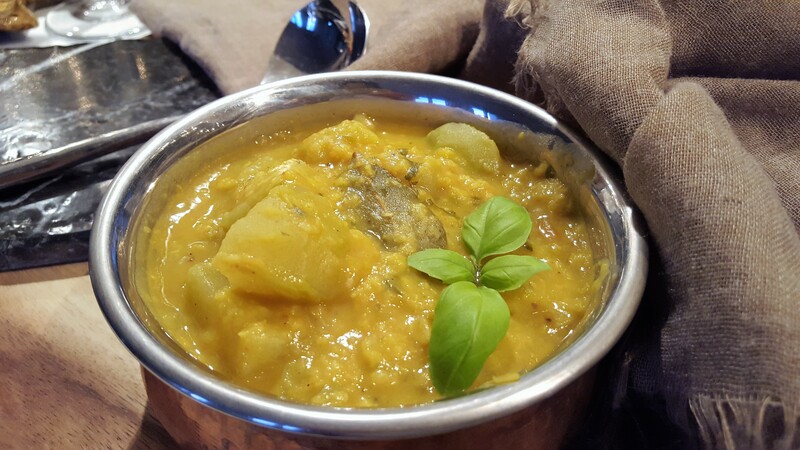 The combination of chayote and dhal makes it quite a wholesome dish and a perfect accompaniment with any other dishes. Dishes like these I find is always a hit and very comforting. As I say it is always the simplest and easiest food that taste so good, and yet full of all good things. For me a powerhouse of energy boost that I enjoy very much. Served with oiled rice, Roti, Pharata, Pitta bread or Naan. Wash the dhal in cold water. Place the washed dhal/lentils in a deep saucepan. Add the water, cloves, and bay leaves, salt and bring to the boil, then simmer for around 15-20 minutes, until the dhal/lentils start to break down and become soft. (You will need to keep an eye when boiling dhal stirring occasionally and removing the white foam like scum that comes up as the dhal comes to a boil). Meanwhile, heat the vegetable oil or ghee in a saucepan start to prepare the spice mixture (tarka). Add the sliced onions, cumin seeds, curry leaves, turmeric, ginger and garlic. Cook for a few seconds then add the cubed chayote to the spices, followed by the chopped tomatoes. Leave to cook on medium heat until the chayote are tender (almost half cooked), test by inserting a sharp knife it goes through, it cooked. Do not stir too much otherwise the vegetable will turn mushy. Now add the cooked dhal to the part-cooked chayote and leave to simmer for another 5-10 minutes until all the spices have incorporated into the dhal. Taste for seasoning and add as necessary. Add a handful of the chopped coriander into the mixture. Before serving add the rest of the chopped coriander leaves as a garnish. Serve with your desired accompaniment.